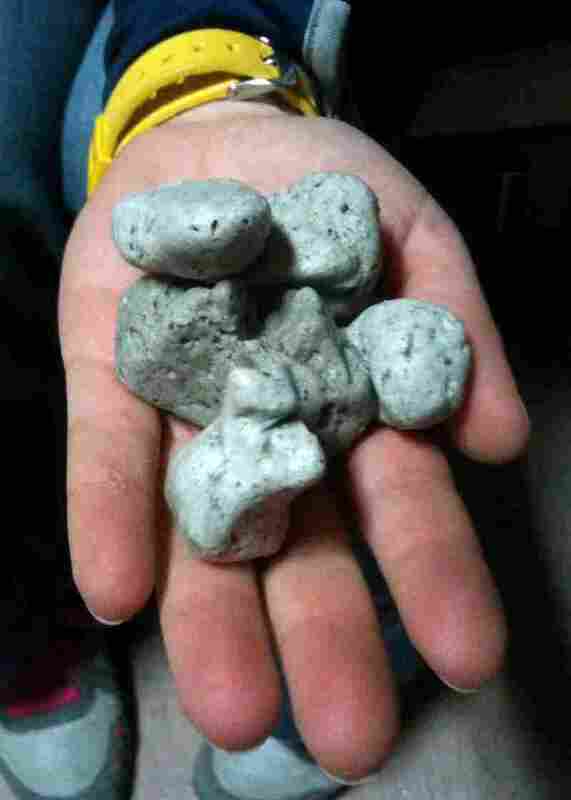 7,500 Square Miles Of Pumice Floating In Pacific Is 'Weirdest Thing I've Seen' : The Two-Way The rocks, floating in the waters near New Zealand, must have been created by an underwater volcano. The floating mass is about 200 square miles larger than New Jersey. This photo photo from the New Zealand Defense Force shows a handful of the rocks found floating in the South Pacific. Nearly 300 miles long and about 35 miles wide, a floating raft of pumice in the South Pacific Ocean is "the wierdest thing I've seen in 18 years at sea," says Royal Australian Navy Lt. Tim Oscar. He was aboard the Royal New Zealand Navy's HMNZS Canterbury on Thursday when the "amphibious support ship" investigated the phenomenon. According to a news release from the New Zealand Defense Force that's been posted online by Scoop Independent News, Oscar added that "as far ahead as I could observe was a raft of pumice moving up and down with the swell. The rock looked to be sitting two feet above the surface of the waves, and lit up a brilliant white color in the spotlight. It looked exactly like the edge of an ice shelf." The pumice must have come from an underwater volcano, as the BBC writes. They posed no danger to the Canterbury. At 7,500 square miles, by the way, the pumice raft is about 200 square miles larger than New Jersey. There's some video taken from a Royal New Zealand Air Force plane here.